There are many things you can find in this island, one of them is former refuge camp in Galang Island, Batam. Here you can see pictures, tombs, wrecked ships and other historical things. You can also see the majestic Masjid Raya Batam located at Batam center. This middle-eastern architectured masjid is unique. You won't see any pillar here, making it look very spacious, and the dome is like no other: it is in a shape of a pyramid. There's Maha Duta Maitreya Temple, the biggest temple in Southeast Asia. This temple is located in Sei Panas. Sei Panas is so close to both Singapore and Malaysia, making the temple is usually visited by both country's citizen to do prayer or just look at this temple's majesty. 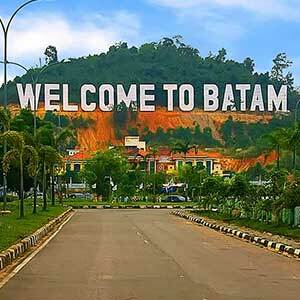 As Batam is close Singapore and close to the busiest shipping route in the world, the city is very much international orientated and very good for shopping. There are several shopping centers such as Batam City Square and Mega Mall which will offer you many international products from well-known brands. There's also Lucky Plaza in Nagoya, the biggest in Batam, which will offer you various kinds of electronic devices. Batam also offers you some nature like Nongsa Beach and Waterfront City. 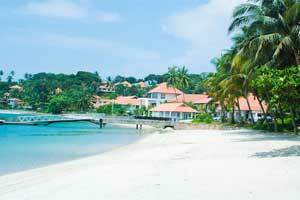 You will be able to do water skiing, parasailing, wind surfing, canoeing, etc. If you're in Batam, don't forget to taste the most favorite food in the city, Gonggong. Gonggong is typically from Batam, made of white snail and served with nut condiment. If you want to bring souvenisrs for friends and family at home you can buy many kinds of banana cake, dragon fruit cake, roasted bingka and bilis cake.